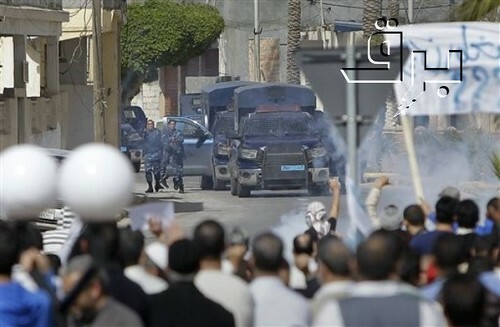 Libyan police fire tear gas at anti-Qadafi protesters as they demonstrate in the Tajoura district of eastern Tripoli, Libya, Friday, March 4, 2011. Photo by BRQ Network under a CC Licence. The overthrow of Colonel Qadafi is welcome, although his fate was gruesome. But many have forgotten that just over a year ago, the human-rights-abusing Qadafi was so chummy with the British coalition government that UK companies were given licences to sell him crowd control and small arms ammunition and tear gas. For the last seven years, Qadafi had access to the largely unfettered international arms market. Could he have resisted for so long, and repressed his people with such ease, otherwise? In 2003 Qadafi renounced international terrorism and promised to give up his weapons of mass destruction. In October 2004 the European Union lifted its arms embargo on Libya. Immediately, any principled objection to selling weapons to Qadafi – that he had commissioned terrorist atrocities and was a gross abuser of human rights – was cast aside in favour of short-term commercial gain for arms companies. The UK government’s Defence Export Services Organization (DESO) held a seminar on the ‘emerging market’ of Libya in 2005. The Defence Manufacturers Association described Libya as ‘a relatively sophisticated customer’. DESO opened a Tripoli office in January 2006. In 2007 Tony Blair visited Libya. Qadafi awarded MBDA, a company part-owned by BAE, a $420 million contract for anti-tank missiles and a communications system. General Dynamics UK won a $130 million contract to supply radios to an élite Libyan army brigade, named after and commanded by Qadafi’s son Khamis. The government’s arms sales unit, now renamed UKTI DSO, identified Libya as a ‘key market’ for 2008-09 and a ‘priority’ market for the following two financial years. Qadafi’s regime only stopped being a ‘priority’ market in February this year – one week after widespread protests had erupted in the country. As befits a favoured customer, in 2009 Libya was invited to a major arms fair in London – DSEI – and in 2010 to the Farnborough International Airshow. UKTI DSO exhibited at arms fairs in Tripoli in 2009 and 2010. A recent Amnesty report stated that ‘the British company NMS International Group Ltd manufactures armoured crowd control vehicles that look identical to the ones seen patrolling Libyan streets in February 2011’. According to Amnesty, the company had attended an arms fair in Tripoli in 2010. The UK government permitted the supply to Qadafi of a wide range of military equipment in 2009 and 2010. According to a recent Parliamentary report in 2009, licences were granted for command, communications and intelligence equipment, shotguns, teargas, and military vehicle communications equipment. In 2010, licences for thermal imaging technology, crowd control and small arms ammunition and teargas were also issued. Between 2008 and the last quarter of 2010 arms export licences worth $100 million were issued for Libya. When Qadafi went back to pariah status in February/March this year, the coalition government swiftly revoked many of the licences for arms exports to Libya. However, no doubt as a ‘sophisticated customer’, Qadafi was still able to use extensively his tactical communications equipment, crowd control vehicles, shotguns, small arms ammunition and teargas already supplied by the UK in the war that followed against the rebels. Although the UK government has said it found no evidence that UK-supplied equipment had been used by Qadafi to commit human rights abuses, that is hardly surprising in the fog of war. Britain was, of course, not alone in arming Qadafi. Amnesty identified 10 states which had armed him. During the war, Qadafi committed war crimes and gross human rights violations, and was indicted by the International Criminal Court. During the war he used Russian-made Grad rockets, Chinese mines, Italian 155mm artillery rounds and Spanish 120mm mortar rounds containing cluster submunitions. The Khamis Brigade committed atrocities in Benghazi and Misrata, and slaughtered 45 prisoners of war in August. Qadafi’s suppliers, will, of course, not be facing any penalty for having profited from arming these monsters. Once sold, weapons can be used years later. Revoking licences at a moment of crisis does not stop tyrants using them. Large companies profit from the arms trade without facing the costs of their actions. It is ordinary people who are maimed, killed or see their livelihoods ruined, who suffer because of the arms trade. Governments should stop promoting arms sales and stop arming tyrants. Nicholas Gilby is the author of the No-Nonsense Guide to the Arms Trade. The December 2012 issue of New Internationalist, which looks in depth at the arms trade, is out soon.